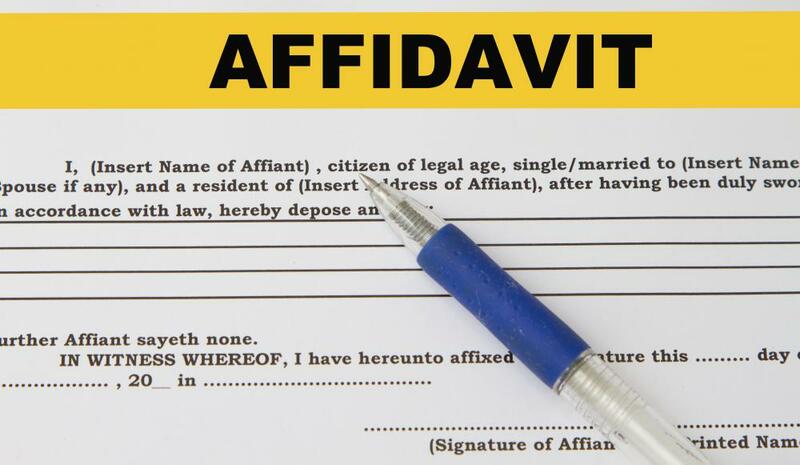 What is a Repossession Affidavit? Repossession affidavits are filed with the department of motor vehicles upon the repossession of an automobile. A repossession affidavit is a legal statement filed with a department of motor vehicles when a lender repossesses a car. This document informs government authorities that the car has been repossessed and provides details about the action, and it is kept on file with other documents pertaining to the vehicle. The repossession affidavit also entitles the lender to receive a new certificate of title without the borrower's name on it, allowing the lender to sell the car to cover the cost of the loan. Lenders typically use the car itself as collateral when making an auto loan. Until the borrower has paid the vehicle off, the lender retains the right to repossess it for non-payment, and the title includes a lien from the lender, meaning that the borrower cannot sell the vehicle without explicit consent from the lender. When borrowers begin to lag on payments, the lender can issue a warning that the car will be repossessed unless the borrower can get current, and if the borrower does not take action, the lender can take the car back. An agent of the lender, often a freelance representative of a repossession agency, goes to collect the vehicle. This can require tracking the vehicle, if the borrower has attempted to move it to a different location. Once the car has been taken back into the lender's possession, the repossession affidavit is filed. This document informs government authorities that the car has been repossessed, provides identifying details including make, model, color, and vehicle identification number, and notes the balance left on the loan at the time of repossession. Similar filings can be used for boats and other vehicles when they are repossessed, and lenders can also file an repossession affidavit with a title company when they take over a home for nonpayment of a mortgage loan. This document must be on file to remove the borrower from the title, clearing the title so the object in question can be sold. Buyers should note that buying repossessed property usually comes with an as-is disclaimer, and the title may not be clear at the time of purchase if other liens have been added by creditors. If property is repossessed in error, the repossession affidavit is one of the documents used to track the source of the error and restore the property to the rightful owner. Erroneous repossession is rare but can happen, and people who have had property taken without legal authority can ask for detailed documentation in the process of resolving the situation.